The day after the Stanley Cup Playoffs end is always a very hard day. No game to look forward to. No tension building in a series. No more hockey games…for a couple months anyway. Those were, without a doubt, one of the greatest editions of the Stanley Cup Playoffs ever. The upstart Philadelphia Flyers. 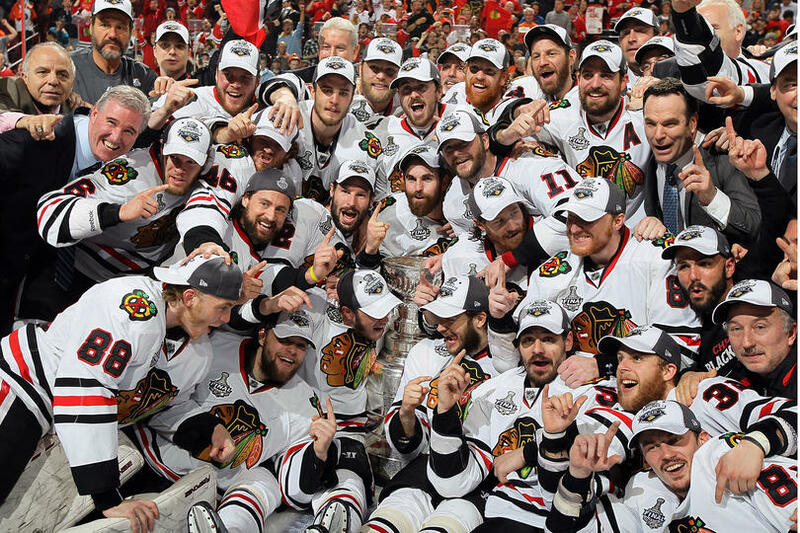 The ready-to-be-annointed Chicago Blackhawks. Awesome. So, before we close the book on 2010, let’s take a quick look at the things that made the 2010 playoffs so memorable. Most shocking series upset – Montreal over Washington. The Caps finished the regular season 33 points ahead of Les Canadiens. They had Ovechkin and Semin and Backstrom and Théodore. But Montreal had Michael Cammalleri! His five goals in seven games, a complete collapse by Washington’s goaltending and Jaroslav Halak made Montreal the first-ever eighth-seed to come back from a three games-to-one series deficit. Best goaltending performance – The tandem of Brian Boucher and Michael Leighton take this one, hands down. In the opening round, Boucher vanquished the heavily-favoured New Jersey Devils in just five games. Then, after Boucher was injured in Game Five v. Boston, Leighton stepped in and led just the third-ever three games-to-none series come back in the history of the NHL! Then, against Montreal, Leighton did it again – clearly outplaying Jaroslav Halak. Worst goaltending performance – Sadly, this also goes to Michael Leighton. Frankly, if the Flyers had received any kind of reasonable goaltending in the Stanley Cup Final, we’d be readying to watch Game Seven tomorrow night. You know why Leighton didn’t move after Patrick Kane’s Stanley Cup-winning goal went into the net? He was mortified with disgust that he’d let yet another horrible goal get past him. 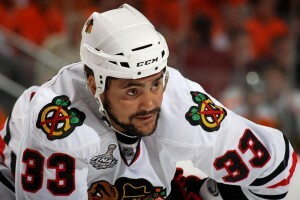 Biggest breakout individual performance – That would be Blackhawks’ forward Dustin Byfuglien. He essentially defeated the San Jose Sharks, in the Western Conference Final, singlehandedly. Buff scored three game-winning goals in that series, including the overtime marker in Game Three. Philly’s Ville Leino runs a close second in this one. Most disappointing team performance – Vancouver Canucks (who else?) Year after year, we hear about Roberto Luongo’s incredible ability and how it’s time for the Sedin sisters to break out. I am getting so tired of it. I could go into a long spiel about why they don’t ever win anything – but this will have to suffice. They all don’t want it enough. Period. Most overplayed story – It’s a tie. Chris Pronger taking the pucks after the games in the Stanley Cup Final. Like, who gives a s**t? 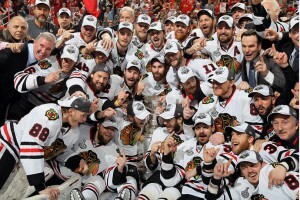 And Marian Hossa finally winning the Stanley Cup after three different tries with three different teams. I don’t care how many times Hossa struck out. Call me when it’s a player who actually gives 100% effort every game. Most surprising number – That would be 12…as in the number of points Danny scored in the Stanley Cup Final. That’s just one shy of the Stanley Cup Final record – set by Wayne Gretzky in 1988. 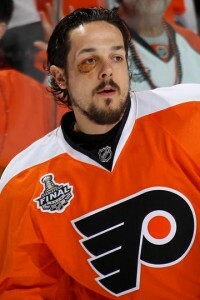 And Brière also took a wicked stick in the face in Game Five. Atta boy, Danny! Worst Stanley Cup-winning goal – Since there was only one, that honour would go to Patrick Kane. The Windy City and Kane loved it, but it was the worst Cup winner since 1966 when, also in overtime, Henri Richard and the Montréal Canadiens pulled off the old OK-boys-let’s-all-slide-into-the-net-and-hope-they-count-it winner on Detroit’s Roger Crozier. I still can’t believe they counted that one. At least Kane’s legitimately went into the net. And that made it the best ever, right Chicago? WHAT ABOUT THE MOST HORRIBLE UPSET OF ALL!?!?!? THE PENS NOT MAKING IT TO THE FINAL AND JONATHAN TOEWS BECOMING THE SECOND TO SIDNEY’S RECORD OF THE YOUNGEST CAPTAIN TO HOIST THE CUP!?!?!?!?!?!?!?! 1st – @Blosby: Toews is younger than Sid. 2nd – The best goaltender was clearly Halak. Leighton was never spectacular and had a better team in front. When Halak was average, the Habs lost. He stole two series from the top two teams in the east. Leighton was only ever average and often weak. If Halak played for the Flyers, they win the cup. BTW, never mind Kane’s winner, what about Sharp’s softie? That’s horrible. And Niemi wasn’t much better… who says goaltending wins cups? I understand what you are saying about Halak, but Leighton and Boucher stole THREE series. And would’ve won a fourth if they’d been able to do anything in the Stanley Cup Final. Either way, great goaltending sure is fun to watch, isn’t it? Hey Big Mouth, what do you think of Toews winning the Conn Smythe?? For me that was a bit of a stretch. My vote would have been for Byfuglien instead. I don’t think the mucky-mucks in the league office wanted to give the trophy to an “energy” player. Jonathan Toews was the absolute WRONG choice. My vote would have gone to Patrick Kane. No-brainer, really. He finished a hair behind Toews in Blackhawks’ scoring and he had balanced scoring throughout the playoffs (7 pts v. NSH, 8 v. VAN, 5 v. SJ in a low-scoring series and 8 v. PHI). In the Stanley Cup Final, Kane had five points in the last two games, including the Stanley-Cup winner. There’s your Conn Smythe recipient right there! Yes, BM, there’s nothing like great goaltending in the Stanley Cup finals…and that was nothing like great goaltending in the SCF. And to me, it’s such a shame to have watched the Flyers (who had absolutely no business being there) work their way toward the most improbably Stanley Cup championship ever – only to be undone by their perrenial nemesis – goaltending. Although, s**tty goaltending means one thing – lots of scoring! And we all like that.